Mort Künstler Hand Signed and Numbered Limited Edition Canvas Giclee :"The Winds of Change (Washington at Valley Forge)"
Title: "The Winds of Change"- Washington at Valley Forge, March 4, 1778. Image Dimensions: 16" x 25" , 21" x 33", 25" x 40" and 33" x 52". 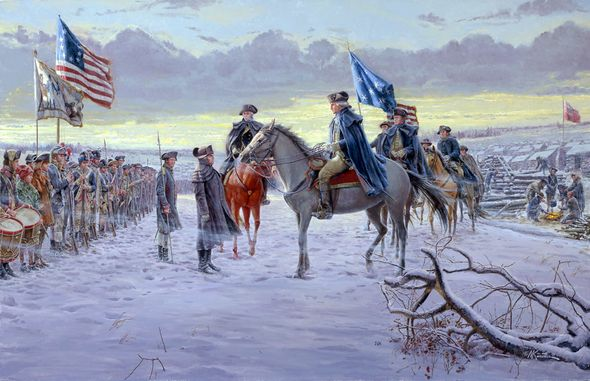 From the Artist : The soldiers serving under General George Washington in December 1777 could not understand his decision to move them into winter quarters in Valley Forge, Pennsylvania. While General Washington believed the site an ideal location to allow him to continue to contest the British for control of the countryside around Philadelphia, the Continental army saw nothing except trees, open fields, and a few farmhouses. Traditionally armies spent the winter in towns, where they could find food, shelter, and civilian companionship. But this would become a winter of crisis, with food supplies running out, snow falling, freezing rain turning roads to slush, and overflowing rivers washing out bridges, fords, and ferries that prevented supplies from reaching camp. While Washington promised to tend to his soldiers' needs, he feared their trust and obedience would not last long without some change. He warned Congress, "this army must inevitably be reduced to one or other of these three things: starve - dissolve - or disperse." The crisis peaked in mid-February when food ran out completely and famine threatened. But Washington, a combat veteran, knew nothing mattered to soldiers more than the fundamental necessities: food, drink, clothing, shelter, sanitation, sleep - and hope in the future. While ordering his troops to build huts to establish a reasonable degree of shelter, Washington worked like an ox to secure the other necessities for his men. The Continentals saw him working, day and night, on their behalf. Valley Forge transformed the relationship between the general and his soldiers. After that terrible winter was over, they would follow Washington anywhere. Washington had help at Valley Forge. An important - if unlikely - hero was Friedrich Steuben, often called the Baron von Steuben. Although he barely spoke a word of English, Steuben's talents were substantial. As the new inspector general of the army, he arrived at Valley Forge on February 23 and proceeded to draw up and enforce a new manual of drill training for the entire Continental army. The troops at Valley Forge eventually became well fed and more cheerful as they were drilled efficiently under Steuben's directions. 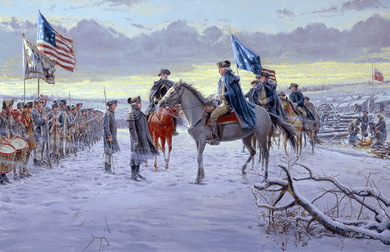 From Mort : When searching for a defining moment of the Revolution, I always think of Washington at Valley Forge. I had painted the Father of our Country a number of times, but never as a major oil painting at that time of our nation's War of Independence. Finally the opportunity came when a good friend of mine wanted to know if I would be interested in painting George Washington. His only stipulation was that it be colorful. I leapt at the chance. After reading whatever I could in advance, I visited Valley Forge National Historical Park and had a tour of all the pertinent sites with its then chief historian, Dona McDermott. I examined all previous art that had been done of Washington at Valley Forge and realized no one had ever done one painting showing Washington, von Steuben, Lafayette, and Alexander Hamilton all at the same time. I also wanted to be able to show snow on the ground. When I learned that von Steuben arrived on February 23rd, and there was a heavy snowfall on March 3rd, I had my timeframe for the painting. The scene shows von Steuben, who is on foot, talking with Washington, who has ridden up to see how the drilling of the troops is going. No more than twenty-five or thirty men could be drilled at any one time. The troops, including Washington's Life Guards, wait at ease. Their white silk standard flies in the upper left of the painting alongside a "Betsy Ross" style flag. Directly between Washington and von Steuben is the mounted Marquis de Lafayette. The flag directly behind the Commander in Chief is Washington's Headquarters flag. The original is preserved and in the collection of the Museum of the American Revolution in Philadelphia, whose former chief historian, Thomas Fleming, was of enormous help in the research that went into this painting. Alexander Hamilton, the next most prominent rider under the flags and immediately in back of Washington, is easily recognized - his picture is on the $10 bill. In the winter of 1777-78 Valley Forge was the fifth largest city in what was then the United Colonies. I realized that I could show the enormous size of the encampment, and the hardship the men endured, by showing as much of the cabins as possible. I was also able to get in a construction scene in the middle ground to the immediate right of the General's entourage. Part of the crew warms up around a fire. Behind them, in the background near the cabins, is the regimental standard of the Pennsylvania regiment present at Valley Forge during that epic winter of hardship. I have used the light streak of the setting sun to create a maximum of contrast against the black of Washington's hat to take the eye to the center of interest, George Washington. The line-up of the troops behind von Steuben forms a visual arrow with the point leading the eye to Washington, as does the broken limb in the right foreground. In the far background can be seen the stumps of all the trees needed to build the cabin city, as well as heat it.